This week’s featured posts are “Academic Freedom and Institutional Power at My Old School” about the University of Chicago’s denunciation of trigger warnings and its affirmation of “controversial” speakers; and “About the Foundation“, which makes the case that the “scandal” of the Clinton Foundation has a lot less substance than you might think. Donald Trump appears to have finally found ten seconds to think about his immigration proposals. Wow, deporting 11 million people would be tough to do, wouldn’t it? Who knew? (Well, just about everybody Trump debated in the primaries, to name a dozen or so.) Maybe he’s rethinking it. Or maybe not. Watch this space. You know who should be paying attention to this? Not just the people who voted for Trump in a primary because they wanted 11 million brown people rounded up and tossed out on their ears, but also the mainstream Republicans who were placated when Trump said he would appoint Supreme Court justices from a list of judges with sound conservative credentials. When it gets to be decision time, that promise won’t mean anything either. Slate‘s Jamelle Bouie makes an even stronger statement about Trump “outreach” to black voters than I did last week: It’s really a dog whistle to white supremacists. The University of Chicago, where I did my graduate work in the late 70s and early 80s, made the news this week when the Dean of Students sent a somewhat adversarial welcome-letter to the incoming freshman class, warning them not to expect any safe spaces on campus. This whole notion of academic freedom threatened by over-sensitive students, who want to be educated without ever being challenged, and of brave U of C administrators standing up to them, is bogus. I challenge the Dean’s underlying assumptions and relate some of my own experiences in “Academic Freedom and Institutional Power at My Old School“. 49er quarterback Colin Kaepernick has kind of a complicated racial heritage: He’s a mixed race child (African/European) who was adopted and raised by white parents alongside their white children. In my judgment, he could pass for a white guy with a good tan. Footballwise, he’s a huge talent whose career has been relatively disappointing so far, kind of like Robert Griffin III or Cam Newton until he broke out last year. Five years from now, he could be in the Super Bowl or he could be selling insurance somewhere. This aroused a bunch of anger against him, like fans burning his jersey. It’s a fundamentally convoluted response: We hate this guy for speaking his mind because Freedom. I doubt Kaepernick’s disapproval will induce America to change its ways with regard to race, but maybe it will start a much-needed discussion about “The Star-Spangled Banner” and the flag-worshipping rituals at sporting events. To my mind, beginning a sporting contest with the anthem (or with two anthems if a U.S.-based team plays one from Toronto or Vancouver) is a strange practice we would never start today if it weren’t already traditional. We don’t begin movies or plays or concerts with the national anthem, so why sports? There’s nothing particularly patriotic about playing or watching sports. And if some terrorists or revolutionaries want to take time off from their plotting to root for the Cubs, I don’t see the harm. Personally, I stand respectfully when the anthem is played before a Nashua Silver Knights baseball game, but I’m doing it to avoid calling attention to myself, and I resent being forced to make a political statement before I can watch the game. which refer to the fact that the British encouraged American slaves to run away during the War of 1812, when the anthem was written. But Francis Scott Key is cheered by the fact that a lot of them died anyway. Go, USA! Maybe we could just play ball, and skip all this nonsense. 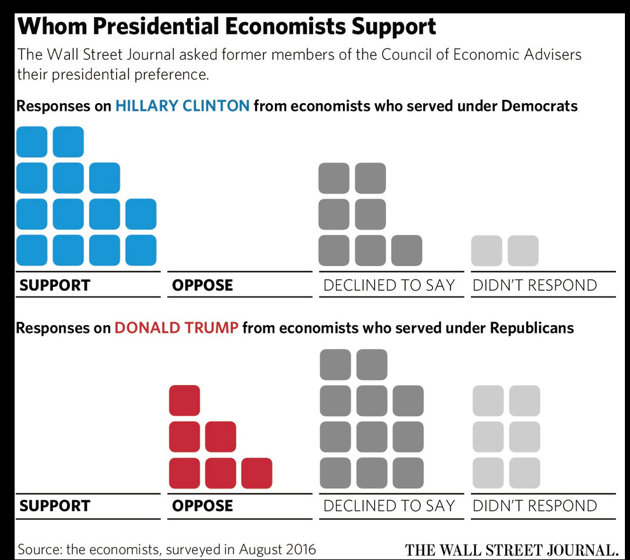 Incredibly, the WSJ could find no living member of any president’s Council of Economic Advisers who supports Trump. Last week’s discussion of private prisons caused one of the commenters to point out an amazing article “My Four Months as a Private Prison Guard“, which appeared a few months ago in Mother Jones. It’s long and horrifying, but well worth the time and discomfort. The article is a combination of an expose with a personalized Stanford prison experiment. Being a guard really does start to change the writer. The other thing that comes through is the complete absence of any notion of rehabilitation. Literally no one in the story cares about the prisoners as people, or about returning them to society. In Newsweek Kurt Eichenwald explores “Donald Trump’s God Problem“. Though more accurately, the problem doesn’t belong to Trump, it belongs to the evangelical leaders — like James Dobson — who not only support Trump, but who claim that their support is based on their Christianity. The primary issue here is the credibility of evangelicalism, particularly as it relates to politics. For years, there has been a logic to the evangelists’ support of the Republican Party: Both held similar views on most social issues, and there was more public discussion by conservative candidates about how faith informed their policies. This year, that is not true. Instead, you have a man whose positions on important social issues have changed, whose faith is obviously shallow and who seems to know nothing about even the basics of evangelicalism, Christianity or the Bible. Mr. Dobson, if Donald Trump represents Christian values, those values mean nothing. By endorsing him, evangelists are creating the image that what matters to them is political influence, not the word of God. Eichenwald could just as validly be addressing Jerry Falwell Jr., who called Trump “God’s man to lead our great nation at this crucial crossroads in our history” and hallucinated “I’ve seen a man who honors his fiduciary responsibilities through his corporations.” Or the lesser known but still influential theologian Wayne Grudem, who promotes Trump not as the lesser of evils, but as “a morally good choice” (setting off Amy Gannett, who I linked to two weeks ago). I would argue that these power-corrupted leaders are not just “creating the image” that politics drives them, they are exposing the truth about themselves: Conservative politics is now a demonic spirit that possesses the body of evangelical Christianity. It needs to be cast out. A lot of times people say, “If you don’t want to do the time, don’t do the crime.” Really? Have you ever committed a crime? You’ve got more people who are doing drugs on college campuses, in yacht clubs, country clubs — we all know that’s going on. But the SWAT team never shows up there. The SWAT team shows up in the housing projects, where you’ve got poorer people doing fewer drugs, and those people go to prison. But think about it: What if one of the times when you were breaking the law, when you had something illegal in your pocket, in your car, at your party, the police had kicked in those doors. Would you want to be known for the rest of your life based on what happened that night? That is what is happening to millions of people. If rich folks kids get in trouble, they go to rehab. Poor folks kids get in trouble, they go to prison. Take a flight over Rome during the reign of Constantine. There is a tradition for symphony orchestras to perform “The Star Spangled Banner” at the beginning of the very first concert of their new season, but they don’t perform it again until the next new season’s first concert. I was quite surprised to learn when I visited Northern Ireland years ago that in movie theaters “God Save the Queen” is played before the previews and the movie. I did not go to a movie there so I cannot attest to this from personal experience, but friends who are N. Irish have commented about not standing and not feeling guilty during their national anthem because the theater is dark and no one can really see them. It’d be nice to save our national anthem for truly special occasions when it’d be more appropriate. Not only do we have to stand for the national anthem before the game, we now also have to stand for God Bless America in the 7th inning – in addition to Take Me Out to the Ball Game and kiss-cam and whatever else – because the Yankees did it after 9/11 and now if we don’t all do it for every single game the terrorists win. Or something like that. I watched a lot of olympics via the ‘Net. There were other medalists from the US besides Gabby that didn’t place their hand on their heart durinthe anthem. They didn’t get called out. Stupid social media. Sports are deeply mixed up with local/national pride. There’s a reason people root for their country’s Olympic athletes and their city’s sports teams. So the anthem makes sense, really. I get that for the Olympics, but wouldn’t your theory imply that we should sing New York and Boston anthems before Yankee/Red Sox games? Are there New York and Boston anthems? If so, that’s not a bad idea. But I don’t think it’s possible to cleanly separate what teams stand for. Even if the Ottawa Senators and the Toronto Maple Leafs are primarily for Ottawa and Toronto, they’re also kind of for Canada. In purely football terms I like the comparison you make between CK, RGIII and Cam Newton. Three Black players ( how do you know Colin is black? Ask a racist, he’ll tell you) all three fit a profile of the black quarterback who provides a lot of value with his legs, something that the NFL is still adjusting to. All three dogged with attitude issues. One of the biggest differences between Cam Newton and the other two though is that he has had excellent coaching, whereas RGIII and Colin Kaepernick are, to this fans eyes at least, the two worst coached qb’s of the new century. Griffin was basically abused by his coaches, asked to run options on an injured knee across the blasted wasteland that is the turf at Fed Ex field, all while the Snyder spent the teams money like a drunken sailor on pricey free agents. Look for RG3 to rebound in Cleveland of all places. San Fransisco has been a three ring circus ever since they lost the Super Bowl that Colin Kaepernick practically dragged them to, with players suddenly retiring and the head coach running back to college. I really think that CK could rebound if he hooks up with a team that can help him recover. Unfortunately his brave stance is probably going to cost him that second chance. I agree with President Obama who said San Francisco 49ers quarterback Colin Kaepernick was exercising his constitutional right to protest when he sat during the national anthem. I can also burn the flag as a form of protest. The “America First” group act as if America can do no wrong. Both George W. Bush and Barack Obama prove that America does make mistakes.